Measuring and Recording Temperature, Humidity, Pressure, CO2, Motion, Shock, Light and many other Parameters. Encapsulated stainless steel data loggers for recording temperature, humidity and pressure for validation of sterilization and manufacturing processes mainly in the pharmaceutical and food industries. Miniature data loggers, optimized for measuring acceleration, shock and vibration, but equally suitable for temperature, humidity, pressure, light, and many more. The data logger range for every application in environmental, industrial and building monitoring. Central monitoring system with alarming for temperature, humidity, CO2 or movement. Simple, intuitive and convenient - for all applications and industries. Central monitoring system with alarming for high-end applications in the pharmaceutical industry. Data loggers are available in abundance! Talk to our team of experts about your individual problem. With just a few targeted questions, we will be able to recommend a system that is ideally suited for your individual application. Why is it so hard to find the right data logger? A data logger records data and stores those in internal memory. Yet, the term “data” alone suggest that there are an infinite number of different parameters that can be measured and recorded. Even within a measured variable the particular application often determines how a data logging device should be equipped. Many requirements exist for material, size, protection rating, data transmission, probe quality and much more. Please use our data logger selection chart! Temperature, humidity, pressure, light, CO2, acceleration, shock, vibration, position, water level, water quality, rain, wind and many more. Applications for the use of data loggers are near infinite. When taking ‘temperature’, for example, it becomes evident quite quickly that it makes a huge difference whether you want to measure the temperature in a steam autoclave in the pharmaceutical industry, or during a food delivery, or at the bottom of a 200m deep mountain lake. 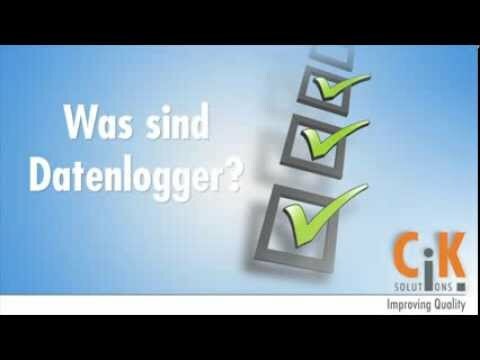 At CiK you will find data loggers for almost every industry and application. Whether it is in pharmaceutical, food or chemical industries, for transport monitoring, space monitoring or warehouse monitoring, or for the environmental monitoring of glaciers, rivers, lakes, wetlands and much more. A method used often is to put the data logger in a computer-connected interface, cradle or docking station. Such a separate interface is not required if the data logger is directly connected to a USB port. In this case, the device can either be inserted directly into the USB socket of the PC or connected with a USB cable. The same applies if the data logger can be connected via Ethernet. If you wish to remove the requirement for cables entirely, options are available where data can be accessed directly via a wireless link such as Bluetooth or WLAN. For most applications, a data logger with a high-quality plastic enclosure is sufficient. Specialist plastics, however, must be used, for example, where extremely low temperatures down to -80°C are to be monitored, or severe shocks can occur. In the pharmaceutical or food industry, data loggers made of stainless steel are frequently used, since these must be food-safe or even accompany a sterilization process. Video: What are data loggers? Even these few selection criteria demonstrate how diverse the data logger landscape has to be to meet the needs of every application in every industry. We will gladly help you to determine the ideal data logger or tailored data logger system for you.